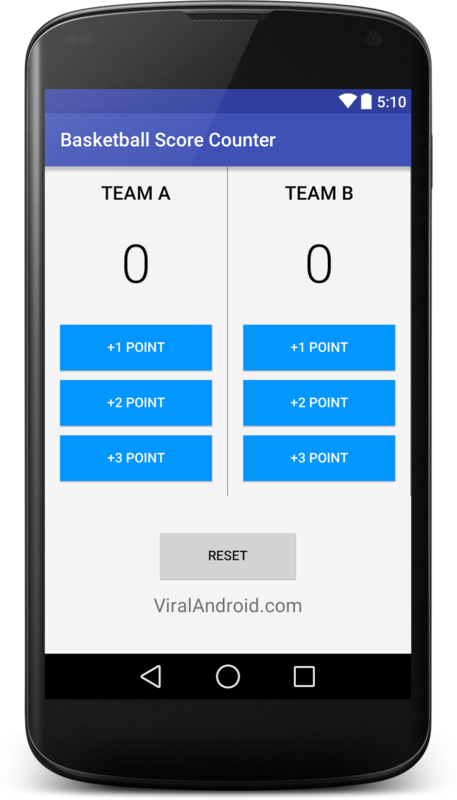 This is a simple basketball score counter android application where you will learn to add different score of two different teams and also learn to reset the score of teams. The default score of teams is o and when you click +1 point button the score increased by one, when you click +2 point button the score increased by two and finally when you click +3 point button the score increased by three. Add following code in your activity_main.xml file. Modified code of MainActivity.java file looks like this. Now, run your application and click the +1 point, +2 point and +3 point buttons of two teams. Download complete Basketball Score Counter Android Application project source code from GitHub.